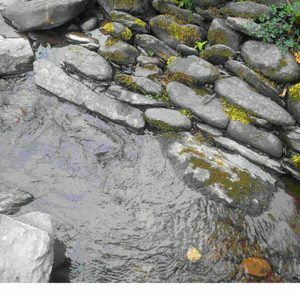 Our research into the mystery third (unused) culvert under Dulverton Laundry. 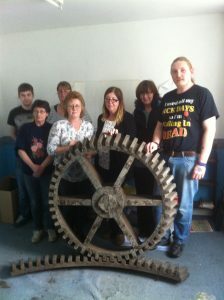 The group hosted a visit by Martin Watts, a respected historic building researcher and mills specialist. 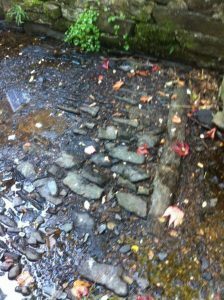 Whilst walking the Dulverton leat Mr Watts was able to identify the original leat cobbled floor behind Dulverton Town Mills. Read more in the above linked document. 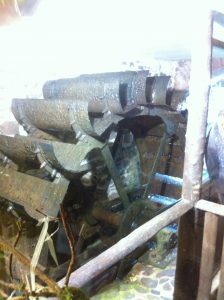 Further work is required to definitively identify when Dulverton’s Watermill Landscape (weir, leat and watermill system) was originally built, most experts believing it to have been constructed in the 11th or 12th centuries. The Watermill Landscape still visible in Dulverton gives clear indications of the town’s importance as an industrial centre and has implications for our understanding of the history of the town itself. 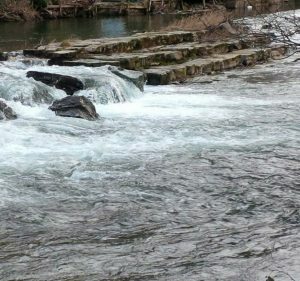 The weir is located on the River Barle on the upstream side of Dulverton. 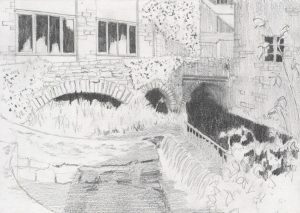 The Dulverton mill leat starts at Weir Head, where it leaves the river Barle to flow south through the western side of the town before rejoining the river south of Dulverton bridge.